Mistake 1 – Doubting that life insurance is reliable. All insurance companies are required to maintain reserves- such as reinsurance – in case one insurance company faces issues, there will be enough reserves to cover the insureds’ policies. These reserves, highly and strictly regulated, are enforced. And since life insurance is solely built on the trust of policy holders, the fate of the insurance industry as a whole would be at state if even ONE policy remained unpaid. In other words, there has not been an insurance claim in US history that was left unpaid for lack of funds. Mistake 2 – Thinking that the primary purpose of life insurance is an investment, with the secondary benefit being protection. The primary purpose of life insurance is to provide a financial benefit, usually to support one’s family in case of a serious illness or death. By all means, investment policies allow the build-up of capital over time, but that isn’t the main purpose of insurance – life or otherwise. It is primarily meant to be a financial safeguard due to a death (life insurance), health problems (disability insurance), or difficulties with activity of daily living (long term care insurance), to name a few types of insurance. Mistake 3 – Choosing a life insurance product basing on the premium alone. If your main factor when buying a life insurance policy becomes the amount of dollars you will be paying for it – that is a mistake. The purchase of life insurance should follow the same type of logical steps you would take with any major purchase. First – determine which insurance product suits your particular needs: whether it is to protect your family in case you are gone, to build a capital over time, against what risks and for how much money, whether you’d need a temporary coverage or permanent, long term or short term. What product and features will suit YOU the best – THEN you think about the cost. What is your ability to pay for what you need for it not to become a financial burden but still provide the needed protection. Every situation is different, every insurance policy can be built to every person’s specific requirements. Mistake 4 – Buying a very basic life insurance policy. Policies that pay claims upon death of the insured with no built in guarantees are the most basic and the least expensive, and definitely have their purpose. But life is full of unpredictable situations. Adding different “twists”, or riders, to the insurance policy, you can assure protection in case of an accident, or a serious terminal illness (where money can be paid before the insured’s death versus after), or if you become disabled and won’t be able to pay premiums, along with many others. Choosing the policy that’s right for you is the most important factor in buying life insurance. 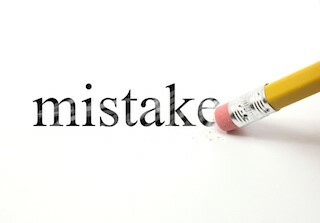 Mistake 5 – Purchasing a life insurance policy and forgetting about it. It is recommended you review your policy once every two years. Life constantly changes, as well as your financial situation, expenses and income. There could be a marriage or a divorce, a child birth or a death of a relative, a purchase or selling of real estate, new mortgage or end of mortgage payments, a raise at a job or becoming unemployed, and others. A regular review enables you to increase or decrease your coverage on existing policies, or purchase new insurance that allows you to continue to meet the demands of your current situation. Mistake 6 – Forgetting to update beneficiaries. A beneficiary is the person or persons who receives the proceeds due to the death of the insured. Choosing beneficiaries is a big responsibility. That is why if you’ve experienced any changes in life circumstances, including marital status, then it is important to make the necessary changes into your life insurance policy, to make sure the right person or persons will be protected. As a whole, take care of the actual protection of your loved ones in advance, and then – enjoy your life! Excalibur Brokerage Agency provides insurance solutions that offer the best in coverage and protection to meet every special need. You can request a free quote today or contact us with any questions at any time at 800-652-9923. Carl Feller – the owner of Excalibur Brokerage Agency – has been a Life and Health Insurance professional for almost 40 years. Carl has been putting his expertise to work with the Brokers who place their business through his Agency, and for the customers who purchase their insurance through him. Carl earned his Bachelor’s Degree in 1978 from Fairleigh Dickinson University, and then entered the insurance industry as an agent with Northwestern Mutual. Carl made his mark at the former Mutual Benefit Life Insurance Company in Newark, NJ where he was Vice President of Individual Disability products. After Mutual Benefit, he went to a John Hancock Agency, helping to build a national brokerage operation, until he decided that he wanted to build his own Agency and put to use all of his knowledge, contacts, and capabilities. Life insurance and its suite of products, Term Insurance, Impaired Risk, Long Term Care, and Disability to name a few, are complex at best to the general public, and each product and company has charted its own maze with underwriting and product options. Carl, being licensed in almost every state, has put his expertise to use on both the customer and Broker side. For his Brokers, as a General Agent for about 30 companies, he pre-underwrites cases, advising on the best product or company for a particular need. For the customer, he strives for that perfect fit: the right product for the right person. About fifteen years ago, Carl ventured into the Senior Market, specializing in Long Term Care. In 2003 he earned his certification as a Long-Term Care Professional (LTCP), co-sponsored by the Health Insurance Association of America (HIAA) and the American Association for Long-Term Care Insurance (AALTCI). As a Long-Term Care Professional and a certified trainer, Carl is very knowledgeable about this particular segment of the market, and has followed it through its evolution. Click Here to read what some of our Agents/Brokers say about Excalibur! Brokers – We’ve Got You Covered! Personal Service to Make Your Life Easier! Consumers! Need a Term Life, Guaranteed Issue, Final Expense, Impaired Risk Life Insurance quote? A life insurance broker committed to making a difference by getting you the low cost life insurance you want. Let’s Talk About Life Insurance! Carl really knows what he is doing. I had a terrible time finding insurance for my father because he has diabetes and not only did Carl help but he never Lied to us to just get the sale only later to find out that the underwriter would not give us the policy.